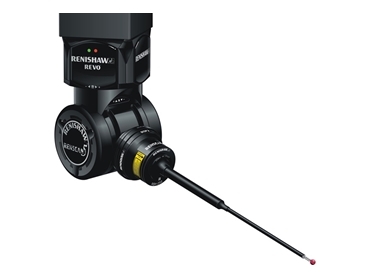 Advanced engineering technologies company, Renishaw will be showcasing a range of metrology systems at the SPE Offshore Exhibition in Aberdeen, UK from 3 – 6 September 2013. Visitors to SPE Offshore 2013 seeking to implement full traceability in their manufacturing process can explore Renishaw’s hardware and software solutions that enable users to produce certification at every stage of the process, from pre-process machine calibration, to online and offline post-process control. Renishaw will be showing their products in Hall 4, Stand 184 at the Aberdeen Exhibition & Conference Centre. Renishaw's exhibits include the REVO, which gives a fast 5-axis measurement capability to maximise coordinate measuring machine (CMM) throughput whilst maintaining high system accuracy. Renishaw's Equator is a lightweight, fast and highly repeatable gauge that operators can use with pushbutton simplicity. Equator's innovative flexible gauging technology is based on the comparison of production parts to a reference master part, which can greatly increase throughput and reduce scrap rates at a fraction of the cost of an equivalent custom gauging system. MDL, part of Renishaw plc, will be showcasing their Fanbeam laser on the Renishaw stand. The Fanbeam is a rugged, high accuracy position reference system for Dynamic Positioning (DP) of work vessels for a range of applications, and has been designed for high accuracy range and bearing measurements from offshore support vessels and other marine structures. Renishaw's machine tool calibration systems will also be on show including the XL-80, which is a compact laser interferometer measurement system that combines portability, performance and ease of use for calibration routines. The QC20-W telescoping ballbar is an innovative calibration tool that allows testing in three orthogonal planes through a single reference point. A single, simple hardware set up means quicker testing and the ability to produce a representative volumetric measurement of positioning accuracy. For SPE Offshore visitors considering parts inspection on their machine tools, the OMV Pro software includes more advanced CMM-type capabilities with an extended range of geometric dimensioning and tolerancing (GD&T) functionality, plus the ability to work with multiple alignments in a single program. The software includes simulation capability, an intuitive graphical interface and crystal-clear reporting format that make it accessible to shop-floor staff. Renishaw Oceania represents the Renishaw Group in Australia.